I wrote about the Roy-Hart girls volleyball team in today's Scholastic Spotlight. I had never visited Roy-Hart before -- it's always cool to visit the different schools of Western New York. You not only get a better feel for whatever story you're writing, it's always neat to see each school's unique characteristics -- including how they decorate their gym. Here are some snapshots of the home of the Rams, including a huge banner that is a tribute to 1986 grad Lou Rosselli, who went on to become an 1996 U.S. Olympic wrestler. 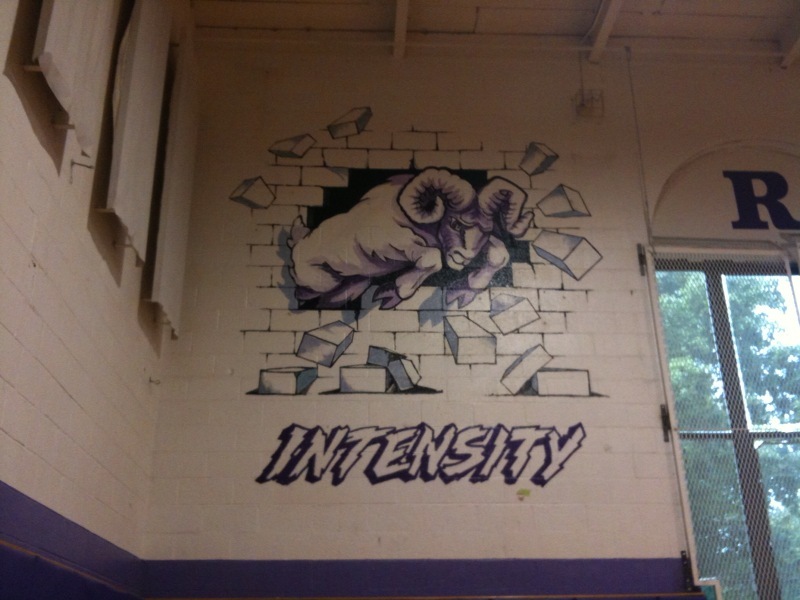 I loved the Ram busting through the wall and the R-A-M-S lettering above the big windows in the gym. Great stuff. It was such a homey environment for what seems to be quite the homey team -- the coach (Bill Holahan) has his daughter (Erin Holahan) as an assistant and a team he calls "the nicest 12 kids in the school." The players, while we're on the family angle, referred to themselves as sisters when I talked to them. Below are some video excerpts from interviews I did last week at the Middleport school with senior captains Michelle Quackenbush and Caitlin Lewandowski as well as junior standout Bridget Shanahan.